From the author of The United States of Arugula--and coauthor of The Film Snob’s Dictionary and The Rock Snob’s Dictionary--a delectable compendium of food facts, terminology, and famous names that gives ordinary folk the wherewithal to take down the Food Snobs--or join their zealous ranks. Open a menu and there they are, those confusing references to “grass-fed” beef, “farmstead” blue cheese, and “dry-farmed” fruits. It doesn’t help that your dinner companions have moved on to such heady topics as the future of the organic movement, or the seminal culinary contributions of Elizabeth Drew and Fernand Point. David Kamp, who demystified the worlds of rock and film for grateful readers, explains it all and more, in The Food Snobs Dictionary. 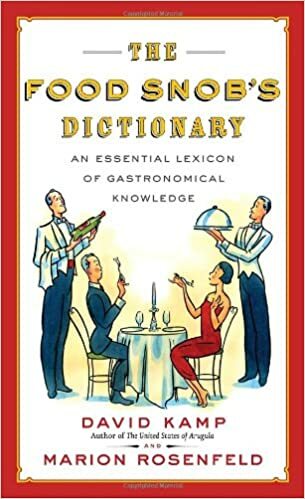 Both entertaining and authentically informative, The Food Snob’ s Dictionary travels through the alphabet explaining the buzz-terms that fuel the food-obsessed, from “Affinage” to “Zest,” with stops along the way for “Cardoons,” “Fennel Pollen,” and “Sous-Vide,” all served up with a huge and welcome dollop of wit.